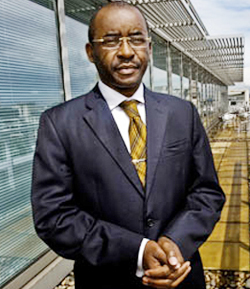 Strive Masiyiwa Buys Bizsetup Group From Max Soutter! It may surprise you to know that Strive Masiyiwa & i have always been very close. For more than 5 years now, I’ve been behind the scenes at Econet Wireless… making things happen. In fact, some have actually called me the ‘real brains behind the whole Billion dollar operation’. Humbly, I’d have to say i couldn’t have done it without Strive and the team! Anyway, turns out, after his extraordinary success in Telecoms, he’s looking to do a little something on the side. As it happens Strive Masiyiwa has been thinking about helping Zimbabwean businesses with their marketing… and that’s where i come in. As a close friend, adviser and Zimbabwe’s foremost marketing expert, he naturally turned to me for guidance on how to break into the field. He was delighted when i mentioned to him that i was actually selling my business – AND for ONLY $50 million dollars! He immediately made arrangements for the transaction (through Kingdom bank of course). Max Soutter gets very rich! I especially like part 4 of the plan. I’d feel terrible about doing such a thing to Strive (him being my hero and all), but i think the $50 mil would go along way towards comforting me in my sorrow. Marketing success doesn’t have to be about reaching the masses. Sometimes, many times in fact, you can do a lot better (faster and easier), just by convincing the right person. One major client is sometimes worth 100 minor ones. Are you targeting the right person or opportunity? Are your marketing efforts reaching the people who can really make a difference to your business? This insight alone is one of the most overlooked opportunities – especially for small businesses. Are you making that mistake? Now Strive is already taken (i mean he can’t be kidnapped twice), but maybe you could try Phillip Chiyangwa or something?! Well, i can’t speak for your sanity Max, but you certainly are by far the best marketer i know. But as for your Kidnapping plan, you might want to re-think that strategy! Good one Max. Behind this crazy humor is an excellent business lesson. You are an inspiration. I enjoy your articles, Max, and particularly this one. The idea of targeting the right person, instead of masses of wrong people, is a good one. I am looking forward to working with you in my yet to be business. I have to think it fast! Greetings Max, and hey man thanks for the 1st of April joke. On a more serious note, I am an aspiring businessman rising from the dust in JHB and would like to be in touch. @ Rich, looking forward to working with you too mate. Thanks for supporting the blog. @Simba – i’d be glad to stay in touch mate. @temba – er thanks. I think! Maybe you’re right, i’ll give the plan a little more thought! as a mother and of all these years, I have done nearly everything a ghetto woman could do from selling tomatoes, being a crossboarder & selling at the flea market. Eye catching headline, Good work on the blog . Will be in touch sir . Thank you Tau, look forward to it. thats a creative blog post you have right here. Good one Sir, Lets talk business…. will call you TODAY…..
Next PostNext "Don't Make Donations To Herald Newspaper, Zimbabwe"